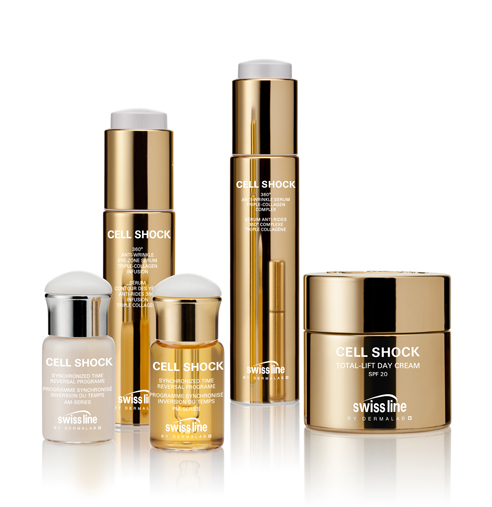 Cell Shock, a results-oriented skincare collection developed to combat the visible signs of aging, is the very heart of Swiss line. Launched over 20 years ago, it has withstood the test of time and consumer scrutiny and emerged as a leading anti-aging collection amongst discerning women worldwide. The products contain scientifically advanced actives, bio-mimetic botanicals that metabolize on a cellular level, and cosmetic ingredients. Cellactel 2 Complex, the predominant scientific ingredient in all of the products, is an evolution of the original cellular therapy ingredient developed at Switzerland’s renowned Clinique Lemana. Exclusive to Swiss line, the innovative Cellactel 2 Complex helps skin cells breathe, preserve energy, and metabolize more efficiently, while increasing collagen and elastin production. The result: firmer, smoother, more radiant-looking skin. Swiss Line Cell Shock Luxe Lift Very Rich Cream - New!